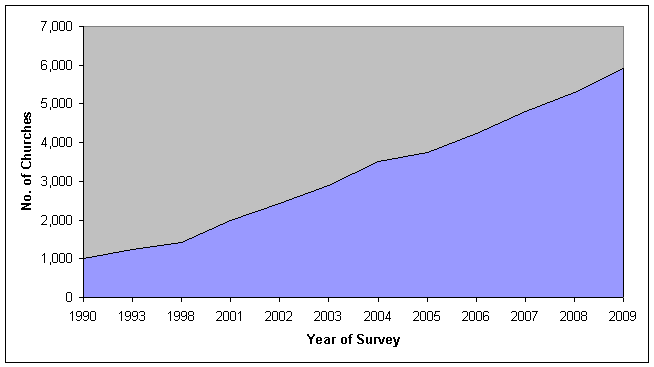 5,916 churches by the end of 2009, an increase of 615 churches from the previous year and a new one year record. Our ability to track and log new churches is now constrained only by our own resource limitations. Of the churches we were able to document, growth throughout the world and touched over sixty denominations. 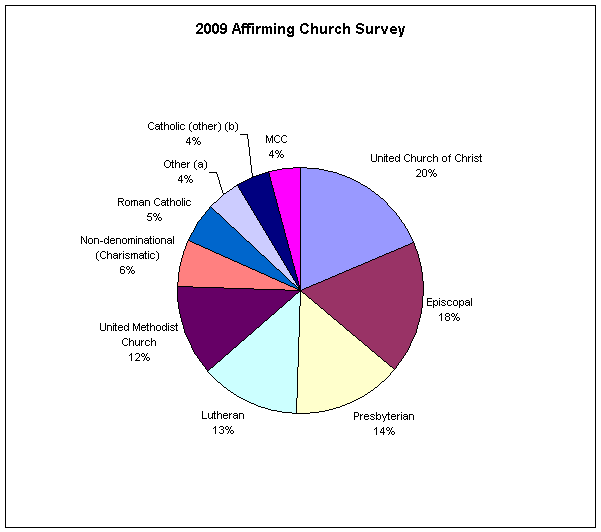 2009 seemed like a carbon copy of 2008 in almost all regards including that five denominations again accounted for almost two thirds of the affirming churches listed. Probably the best way to describe 2009 is that the previous years trends are continuing but at a slightly expedited clip. That being that the top three denominations in the directory (United Church of Christ, Presbyterian and Episcopalian) continue to add affirming congregations at a double digit clip while the ‘old guard’ of the gay Christian movement are holding steady (e.g. M.C.C., Alliance of Christian Churches ect.). What has really caught my eye is the rapid growth within the Presbyterian and Episcopalian churches such that I wonder how long it will be before one of them follows in the United Church of Christ’s foot steps and officially opens their denominations doors to the gay and lesbian community? Currently 7% of the Presbyterian churches (765 of the 11,000 ) and 13% of the the Episcopalian parishes (921 of the 7,000) have requested to be listed in our directory. Not quite at the same level as the U.C.C. churches where 18% of their 5,300 churches have requested to be listed. Still these numbers are exciting and almost mirror the exponential growth we were seeing in the U.C.C. churches prior to their denomination coming out as a whole and taking a pro gay stance. It is important to note that not all of the U.C.C. churches are affirming even though their denomination officially is. If a UCC church is listed in our directory they have responded affirmatively to our invite for them to be listed. I always like to start the yearly report with a few observations concerning the gay Christian movement and how it has unfolded over the years. Historical perspective helps us to appreciate the progress that has been made and gives us, in many cases, an indication of things to come. Please note however that this is from my own perspective of watching the gay Christian movement unfold over the years. Saying that however I’ve had the privilege of watching most of this growth first hand from the mid eighties until today. First as a member of a local MCC congregation and then as the founding pastor of a non-denominational church whose primary ministry was to the gay community. As the nineties drew to a close I followed the Lord’s urging to write the book “Calling the Rainbow Nation Home” and start www.gaychurch.org. The web site has many important missions one of which is a global welcoming Christian church directory to help folks find a church near where they live. Tabulating the global directory over the past eight years has given me a ‘cat bird’ seat to the exponential growth that is taking place. Over the years I’ve come to believe that this movement has gone through two distinct phases. Both can trace their roots back to the late sixties and early seventies however each has had it’s own unique mission, messenger and audience. While their focus has been slightly different, they share a common theme, that being a message of reconciliation. First an invitation to the gay community to ‘come home’ to God and restore their faith and the second being a desire to reconnect with the greater church community. The first phase of the movement began with the emergence of MCC in the late sixties and early 70’s followed later by an influx of non-denominational churches (usually Charismatic) and ministries such as the Alliance of Christian Churches and the Evangelical Network that appeared in the 1980’s. These groups focused largely on planting new churches that ministered primarily to the gay and lesbian community. Their ministerial ranks were filled with an exodus of ministers who had been defrocked by ‘mainstream’ denominations because they were gay. Interestingly enough most of these early ministers came from charismatic or Pentecostal backgrounds, the same denominations that were at the forefront of the anti-gay movement that was occurring at that time. This first wave of the Gay Christian movement was a heady time of church growth and expansion, miracles and evangelistic effort. By the mid 1990’s close to 1,000 churches had been birthed through the efforts of these groups. While relatively small in number, many of these churches and organizations remain an integral and ongoing part of the Christian movement within the gay community today. The second era of the “Rainbow Revival” started just a few years after the first however the results of their labor took longer to come to the fore. The vision of these groups was not to create new churches but to enlighten their particular denominations stance toward the gay and lesbian community (see “denominations”). The fruit of their labors began to make a significant impact on the movement by the late 80’s and early 1990’s. It is this second wave that drives much of the church growth we’re seeing today. Groups such Integrity (Episcopal), More Light Presbyterians, UCC Coalition for LGBT Concerns, Lutherans Concerned, Welcoming and Affirming Baptist, Dignity (Roman Catholic) and Reconciling Ministries Network (UMC) were, and still are, at the very forefront of this ‘second wave’. This second wave of ministry also includes geographically based groups such as Chicago Coalition of Welcoming Churches, Community of Welcoming Congregations (OR and WA) and the New Jersey Lesbian and Gay Coalition whose vision stretches across denominational lines, focusing instead on opening up a specific geographical area for the gay and lesbian community (see “geographic groups”). Web based ministries such as this one are global extensions of the geographically based interdenominational groups. The one key difference being that web based ministries are global in nature with their reach extending to anyone who has access to the Internet. The vision of Luther nailing up his famous “95 Theses” to the door of the church in Wittenberg was vividly in my mind as I posted our first web pages close to seven years ago. Now days instead of a church door, we ‘nail up’ our thoughts into the pages of web sites and blogs. Regardless of how the message gets out one thing is clear. These denominationally, geographically and internet based groups have helped to open thousands of church doors to the gay community over the past forty years. Since then (2007-2009) another 1,716 churches have added to the directory bringing the total number of affirming churches to 5,916 by the close of the decade. It is clear to those of us who are shepherding the www.gaychurch.org affirming Christian church directory, that the number of new churches now being added every year is no longer constrained by the actual number of new churches that are opening their doors to the gay and lesbian community. But instead by the resource limitations of this ministry (there are only two of us!) to find, email and then update the web site with each new affirming church that desires to be listed! Clearly this movement has spread very quickly into the world-wide phenomena that is today. Like the gay community itself, this is a movement crosses virtually all denominational and geographically based lines. Currently the directory contains sixty five different denominations from thirty different countries. The United Church of Christ leads the way with over 991 churches followed by the Episcopalian, Presbyterian and Lutheran churches respectively. The UCC churches and Episcopalian parishes between them account for close to a third of the church directory! In addition, the movement continues to gain traction outside of the United States in places like Canada (United Church of Canada, Anglican and Lutheran), the United Kingdom (Anglican, MCC and Non-denominational) and Australia (Uniting, Anglican, Baptist and MCC Churches). In spite of the continuing growth overseas, mainline denominations located within the United States still make up the vast majority of the directory and account for close to 94% of the churches listed. It is interesting to note the changing nature of the movement with the early forerunners slipping to 6th (non-denominational primarily charismatic churches), 10th (MCC), 15th (Dignity) and 21st (The Alliance) respectively. While their numbers remain relatively steady, it is clear that the second chapter of this movement is a story of how five mainline denominations began to open up their doors to the gay and lesbian community and now account for close to seventy percent of the churches listed. Numbers aside the charismatic churches (e.g. non-denomination, Alliance, ICCC, CCNE, The Evangelical Network and some of the MCC churches) continue to shape, contribute and energize this movement in a way that far exceeds their over all numbers. A large part of this can be attributed to the fact that most of these churches were born out of the gay community to reach and minister back to the gay community. Thus they are a hundred percent invested in seeing the “Rainbow Revival” reach every member of the gay and lesbian community. Includes all other, non Catholic denominations (e.g. Mennonite, Community of Christ, Alliance of Christian Churches, Brethren). Includes all Catholic denominations that are not associated with the Roman Catholic church (e.g. Independent Catholic, American Catholic). One troubling trend that continued from 2008 is that a significant number of the new churches we’ve been adding are not officially affiliated with any gay affirming group within their own denomination. I hope that speaks to the broadening nature of the movement and not to a lack of commitment to reach out to the gay and lesbian community. This is one trend we will continue to monitor in the years ahead. My conclusion remains the same as last year in that I believe that we are rapidly heading toward an important ‘tipping point’ with many in the ‘straight’ community beginning to hear for the first time about the gay Christian movement. Churches and even entire denominations are starting to loudly proclaimed their welcoming stance toward the gay and lesbian (GLBT) community. The changing political climate in our country is encouraging and enabling a greater degree of dialog between the ‘for’ and ‘against’ contingencies. In addition, I’m hearing more and more from the gay community who looking for a church that they can call home. In the internet age people now days turn to search engines and web sites looking for answers to their questions. Social networking sites such as Facebook have diverted some of the ‘social’ traffic away from the web sites (e.g. bulletin board postings are down) however a large number of people use www.gaychurch.org to find answers to their questions and to locate an affirming church in their area. Here are the statistics from the past year for the top three web site ministries that reach out to the gay and lesbian community. Note: “Unique Visitors” means that this was the first time this user logged onto the web site. When they log in a second time they are not counted. In conclusion I believe 2009 was a virtual ‘re-do’ of 2008 in the trends we are seeing. What has changed is that the gay Christian movement continues to build momentum. The softening political climate here in the States has helped to encourage double digit growth while at the same time the movement has clearly ‘jumped the tracks’ and is no longer a phenomena found in only a few denominations located within the United States. This is clearly a world-wide movement that touches over sixty different denominations. Overseas I believe Canada, Australia and the United Kingdom will continue to lead the way. I continue to believe that before this second wave is over at least one, possibly two more mainline denomination will step to the fore and officially announce their welcoming stance toward the gay and lesbian community. When this occurs we will see another huge influx of affirming congregations added to the directory. I am also quite curious as to what the third wave of this movement will be. I have a feeling that the forerunners of this 3rd wave of ministry have already stepped forward with the unique vision, mission and message the Lord has given them. If history is our guide, this third wave will have at it’s core the same message of reconciliation that fueled the first two waves of this movement. However the third wave will have it’s own distinct mission, messenger and audience. I also believe that internet based ministries such as this one will have a key role to play in this next move as our ministries are ‘real-time’ and our reach is global, crossing denominational and geographical lines. The next few years should continue to be ones of great growth for the “Rainbow Revival”. Finally I would like to give my heart felt thanks to Eric for the countless hours of research and correspondence he does with the churches. Without his tireless effort, many of the churches we list in the directory wouldn’t be here today. But that is only a part of his ministry. His loving emails back and forth with the churches has given a ‘face’ to the issue and a voice to the cause for those congregations still wrestling with this issue. Again thank you Eric for laboring in God’s beautiful field as you have.